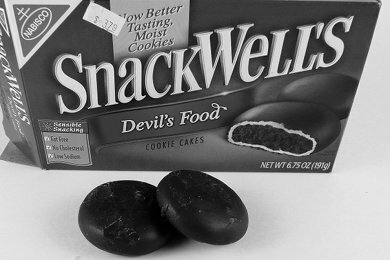 Are SnackWell's the product of Satan? The cookie's name "Devil's Food cake" promises a treat of sinful proportions. AND, they are going to pull it off without fat, cholesterol or sodium. Satan didn't make these cookies, Nabisco did. I believe Satan would have done a better job. The first ingredient listed on the box is sugar. If you are going to give up fat, you have to replace it with something. Later in the ingredients list is high fructose corn syrup (another form of sugar). This is the worst cookie I have ever tasted. I have done MANY tastings for this website and I found these to be inedible. It would be so great if there was a cookie that tasted like chocolate and only had 50 calories, but it just isn't possible. Cookies need to have butter, sugar, and chocolate to taste good. Actually, if you eat real Oreos, you will eat about 55 calories for one cookie. Oreos taste much better, so if you are forced to choose go with Oreos. Or, try the chocolate VitaTops. If you eat 1/2 it is only 50 calories and it tastes so much more delicious. I want to like these just like I wanted to like 100 Calorie Packs. Food manufacturers who promise you a low calorie treat need to deliver on the TREAT part. The snack needs to be delicious if I going to spend the calories. Remember No Bake Brownie Balls are 77 calories! And, trust me, they taste SO much better than a SnackWell's cookie, AND they are healthy. The calories you consume on a daily basis need to be nutritious. It is not good enough to just cut calories and eat substitutes for high calorie foods. You need to eat foods that satisfy your taste buds and your organs. What do you think of SnackWell's? Please share below. I thing those are horrible too!! Snackwell's are gross! I'd rather have a nice homemade cookie before any processed stuff. None of it is worth the calories in my opinion. I hate to disagree with everyone, but I LOVE these cookies! My mother and I use to eat them all of the time. Oh well, I guess I'm just wierd. I've never tried Snackwells. Never intersted me. I did try the 100 calorie pack of Milano cookies. Basically Pepridge Farm took the MIlano cookies and packaged them into 100 calories which is 2 cookies. Hard to find but really good. There are some of the 100 calorie packs that I like, mostly the chips. I actually like the SnackWells, too. I don't know if they still make the Devil's Food with mint, but I thought they were great. But they are rather expensive, and I stopped eating them because of the extra-high sugar content. I absolutely love devils food cookies..
Devil's food should not be this consistency. I do not understand what the wax layer is for between the chocolate shell and the cake. Should I have peeled a rind off like a Mini BabyBel prior to consuming? I wish I had read this prior to buying these "cookies." I absolutely love those cookies, I was just talking to my friend 10 min. ago about how I found my grandparents favorite cookies in hiding & how i love fig newtons,& snackwell's devil food cookies. I then looked up where they sell them still cause now I am wanting them like crazy. LOL So not only are they delicious but my nana & I have a great story & memory about that day. :) <3 snackwell's devil's food cookies YUM YUM!!!! These arent the best thing ive eaten in my life. I think, the strange kinda-chocolate-eh flavor would have been more desirable had there been some sort of fat. Thats because chocolate has a LOAD of fat (which ironically what White Chocolate is made of [no chocolate involved there, just cocoa butter]) . BUT, if you were to throw these into the freezer, it become much more edible. I have tried many, many diet products in my lifetime. Most of them are not even slightly edible or enjoyable. The SnackWell's Devils food cookies are an exception. When fresh, they are a great treat without a lot of calories. I love them and will continue to enjoy them as long as they are on the market. These cookies were on the market long before snackwells pushed the idea that they are healthy. The kicker is they use to come with a white icing which is far better than what you can find now. They were produced by a company on the west coast Very Fine Foods, I believe. Can't find them anywhere, maybe someone on here remembers them? Love Snackwells! I have eaten them since I was a child. Low fat too! I really like these! I remember the ones from when I was a child. Then couldn't find them anymore. Found these. May not be as good as the ones I remember. But still really good. I can eat the whole package in one sitting! Rick sorry to disagree with you the devil's food cake cookies has been around for a long time. The stupidest thing happened, like some other low and no fat foods some marketing morons started advertising the no fat trying to cash in health the craze. Guess what if you didn't know they were fat free like everyone that likes said you'll probably eat the whole package. I LOVE Snackwell's Devils Food Cookie Cakes.